A blue gemstone with white swirls and flecks, sodalite is said to clear up mental confusion and bridge the gap between your thoughts and feelings. Sodalite is said to soothe nervousness and encourage self esteem. Often used as a touchstone for people with high blood pressure as the calming effects of sodalite is said to reduce high blood pressure. 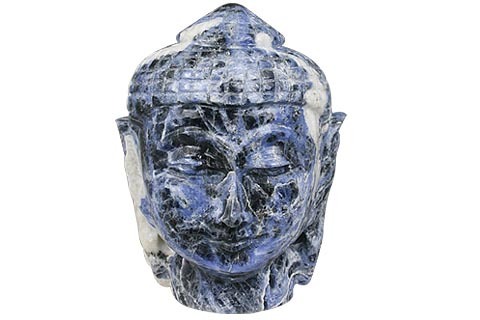 Carved here in the healing section for use with Feng Shui or healing rituals as well as to simply decorate the home. More about Sodalite: Sodalite is named in reference to its sodium content. Physical and Chemical Properties: Sodalite is a deep, rich blue stone with white inclusions typically occurring in nepheline, syenites and related rocks. It is composed of chloric sodium aluminum silicates (Tectosilicates, Sodalite Group – Na4Al3Si3O12Cl). Sodalite rarely forms crystals (dodecahedrons). It has poor cleavage and is uneven to subconchoidal fracture, therefore making it brittle. Soluble in hydrochloric and nitric acids, it also fuses fairly easy. Sodalite protects from external negative energy and is a highly grounding stone. If you use computers too much, wear it to shield against damaging effects of the radiation. Sodalites color symbolizes wisdom and psychic activities. Fosters rational thinking, logic, intelligence, emotional balance, intuition, higher knowledge, clarity, truth and perception. Helps to eliminate confusion, change habits and stimulate ones intellect. Physically, it lowers blood pressure and balances the metabolism. Rich blue masses are found near Bancroft, Ontario. Thinner veins of blue sodalite are found in nepheline rocks on the Ice River, British Columbia. Litchfield, Maine, yields sodalite in smaller masses of moderate richness. Brazil seems to be today’s major producer.